South Africa: This year's host will sport a crest (that's soccer for logo) with a flower inside a shield and SOUTH AFRICA arced below it on a ribbon. Said crest will appear on yellow for the team's "home" games and on green for its "away" matches. Uruguay: This South American squad's crest combines four stars across the top with a vertical AUF ribbon flanked by two stalks and a soccer ball. The home jersey is a light blue, while the away version is white. Mexico: The Mexican team's crest contains an eagle perched on an abstract design, also with a soccer ball. The country's tri-color green/white/red also appears within the crest. The home jersey is green with a sublimated design across the front, while its away counterpart is black. France: While Mexico is using an eagle, France opted for a rooster on its crest. Above the rooster is a single gold star and below are the initials "FFF". The triple-F stands for "Fédération Française de Football". While the French have worn royal blue in the past, this year's squad will compete in a darker version of the blue at "home", while the "away" jersey is white. Nigeria: The Nigerian crest features a "Super Eagle" standing on a ball, contained in a circle of red lines and text. The jerseys are fairly simple with green at home, and white for the away. South Korea: Channeling the "Eye of the Tiger", the South Korean crest features the large cat with a paw on a ball within a blue shield. The jerseys display sublimated tiger striping with the homes being red and the aways in white. Argentina: This iconic team's crest contains a gold shield with a light blue/white/light blue bar and "AFA" on it. The crest is then placed on this iconic shirt for the home kits and this less iconic road version. Greece: The Greek crest is primarily the flag. The team opted for simplicity on the home and away jerseys as well. USA: The American team's crest is a stars-and-stripes laden shield with "US" and a ball striking through it. The home kit features a white jersey with a sublimated sash, while the away jersey is navy with a very noticeable sash. England: Three blue lions grace the English crest. The jerseys are very minimalist, with the homes being white and the aways being red. Slovenia: This crest-within-a-crest design is highlighted by mountains and rings. The mountains are also represented on the home and away jerseys for a Charlie Brown look. Algeria: The team's crest incorporates a soccer ball with the crescent and star if Islam. The home shirt is white and fairly minimalist with a sublimated "Desert Fox" on the right shoulder. The away jersey is a light green with red and white pinstripes. Australia: The Aussie home crest is yellow and takes a globe, flanking it with a kangaroo and ostrich. The away crest is actually black. The home shirt is primarily yellow with forest green shoulders and sleeves. The away jersey, by contrast, is black with blue shoulders and sleeves. Germany: Emblazoned with an eagle within a circle and three stars above, the Germany crest is primarily black and is placed on a white home jersey with the tri-color running down the left side of the front. The away shirt is black. Ghana: Ghana's crest features a red/yellow/green stripe swirling around a black with four stars below it in black. The home jersey is white with black accents and a sublimated star on the right shoulder. The away jersey is red and much more detailed with broad yellow stripes and green trim. 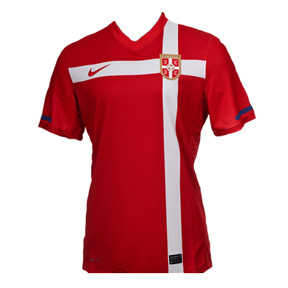 Serbia: The Serbian crest consists of a red shield with a white cross and a gold and white soccer ball. The home jerseys are red and uniquely feature a white cross with the crux at the left chest. The away jersey is a far more basic white model. Cameroon: This African nation boasts a crest on the right chest of its jerseys with a soccer ball placed over the country's green/red/yellow tri-color. Four stars appear above the shield. In addition, the team wears a lion head logo on both of its jerseys on the left chest. The home jersey is green and fairly simple, complete with a sublimated lion head on the right shoulder. The away jersey is yellow, and features red pinstripes. Denmark: The Danish crest is circular in nature and consists of "DBU" with ornamentation and text around it. The text is the spelled out version of DBU, which is "Dansk • Boldspil-Union". The home shirts are red with a patterned white stripe across the midsection. In addition, they feature a polo shirt style collar. The away jersey does not feature the same collar, but contains a more aggressive design. Japan: The Japanese crest consists of a black bird with a ball, a single red vertical stripe on white, and the initials "JFA" above the bird. In addition the country's flag appears above the crest. The home jerseys are a dark royal wit ha red square at the front of the collar. and a sublimated pattern on the chest. The away shirts, by contrast are white. Netherlands: The Dutch crest is a pentagonal shield with a lion's head facing left above the initials "KNVB". The primary jersey is one of the most iconic in all of international soccer, as it is orange with black accents. The clash kit, however, relies on the country's flag for inspiration with red and blue chevrons across the chest, while the crest appears on a circular holding shape. Group F Italy: Like the Dutch, the Italian team does not uses its flag as the basis of its color scheme. Instead, the crest and uniforms primarily blue, white and gold, with green and red used as accents. The crest features blue, red, and green swirls making a ball with the tricolor of the flag behind it on a blue background. Above the tri-color is the word "ITALIA", and at the bottom of the crest there are four gold stars. The home shirts are the team's signature royal blue with a sublimated muscular pattern on the chest. The collar is very interesting, as it displays notches to separate the tri-color trim. Their away counterparts are white with a more traditional collar design that is trimmed in red, blue, and green. New Zealand: The Kiwi team, nicknamed "the All Whites", use a badge that features a leaf over "NEW ZEALAND FOOTBALL" The jerseys are rather minimal, white the primary kit in white, and the clash kit in black. Paraguay: This country's crest is contained in a circle, and consists of crossed red/white/blue striping and a gold star on another circle in the middle. The primary shirts are unique with red and white vertical broad stripes, while the clash jerseys are white with blue Adidas striping. Slovakia: The Slovakian team uses the shield from their flag as a crest. The home jersey is white with blue accents, and the away shirt is blue with a sublimated patten on the chest. Group G Brazil: The top ranked team in the world uses a crest in blue, green, and yellow that consists of a cross with "CBF" inside, and five stars arched over the top. The home jersey is fairly basic: it is a yellow base with green accents. The away jersey, on the other hand, is blue with yellow accents and a dot pattern across the front. Ivory Coast: The only team other than the Netherlands in this year's Cup to sport orange as a primary color, the Ivory Coast's crest proudly displays an elephant whose trunk forms a C. The primary jersey is fairly simple, letting the orange speak for itself, but also features a sublimated elephant on the right shoulder. The clash shirt, however, contains horizontal striping in white and orange on a green base. North Korea: The other Korean nation in the World Cup is full of mystery. While I was able to find a picture of the crest, the jerseys have not been officially unveiled. Portugal: The Portuguese crest features a shield over a cross in red, gold, black, white, and blue. The home jerseys are red with a horizontal green chest stripe. 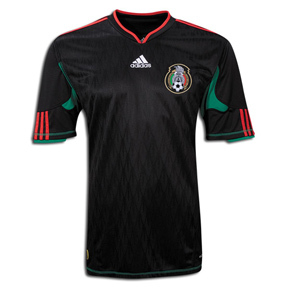 The away version is white and displays two vertical stripes in green and red. Group H Chile: The Chilean squad uses an oval badge with a version of the country's flag as the focal point. 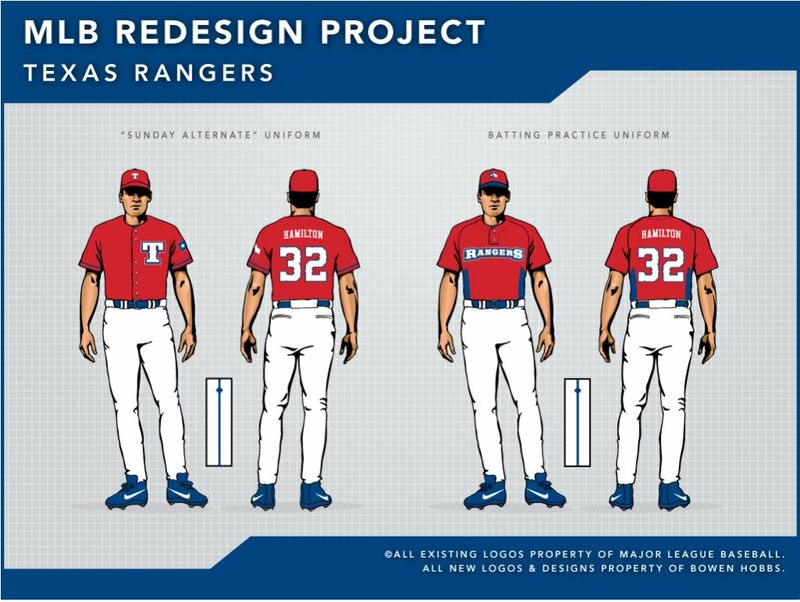 The jerseys are rather simple with red being the home color and white being the away color. Honduras: The Honduran crest is blue and white and contains a tri-color, a soccer ball, and "HONDURAS" at the top. In addition, it is centered rather than placed on the left. The home shirt is white and features a horizontal chest stripe that fades from blue on the sides to white in the middle. 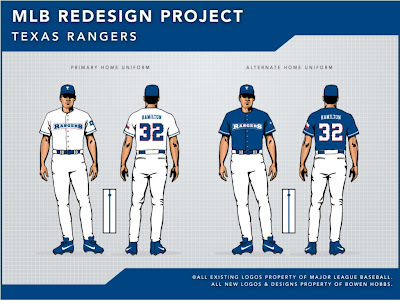 The away jersey is primarily blue and contains broad white vertical stripes below the faded bar. Lastly, the Honduran squad also has a third jersey that is almost all blue. Switzerland: The Swiss have two logos on the front of their jerseys: on the right chest they have their Soccer Federation's logo, and on the left, they have their flag. The primary jerseys are red with a plus sign pattern in the fabric on the front. The clash jerseys are a white version of the reds. Spain: Spain's crest is very detailed featuring, a shield-within-a-shield, a crown, and two pillars. The home jersey is red with athletic gold accents and a segmented pattern on the collar in blue. The away shirt is navy with red and athletic gold accents. So there you have it. With this guide you will more easily be able to identify the teams playing in the 2010 World Cup. 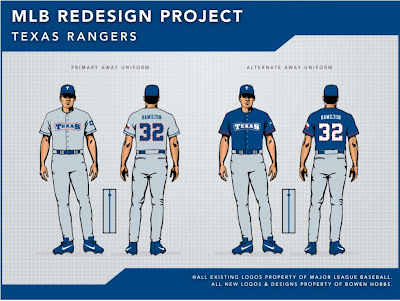 This week's design is for an upcoming Brewers' opponent, the Texas Rangers. The team's existing primary logo is the T from their hats over a baseball in a circle. I felt that there was an opportunity for the logo to be more indicative of the Texas Rangers law enforcement division that the team was named after, so I developed a logo based on a sheriff's badge. 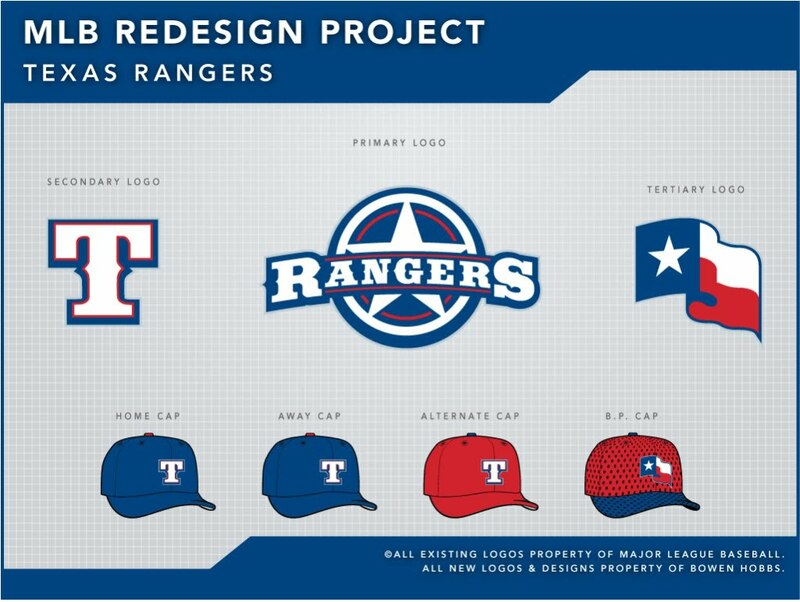 The logo is primaryily blue and white with red accents and a silver outline. For the wordmarks, I used a beefy slab serif font with barbs to take the viewer to the Old West. The secondary logo is a T, but in the new slab serif typeface.The tertiary is the only piece I kept from the current set. It is a logo based on the Texas flag, a great source of pride for Texans. The uniforms feature sleeve and pant trim, but with a catch: the trim has barbs on it to match the look and feel of the typography, in addition to drawing a correlation to the barbed wire fence of ranchers. The tertiary logo appears on the left sleeve, and the numbers are a thick serifed block typeface with custom barbs added. 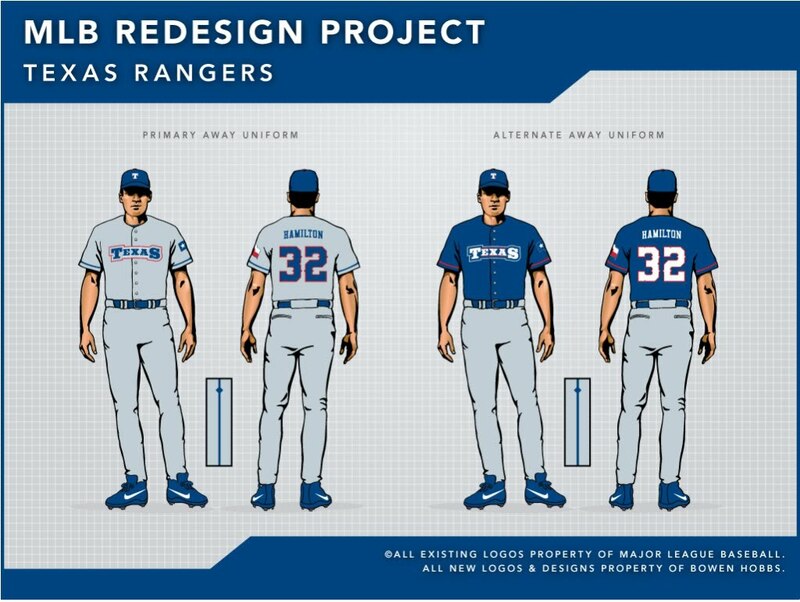 The home uniforms feature RANGERS on the jersey, while TEXAS adorns the road uniforms, which were designed on a cool grey base. The home and road alternate jerseys are both royal blue, while the Sunday Alternate features a red jerseys that uses the T on the left chest. 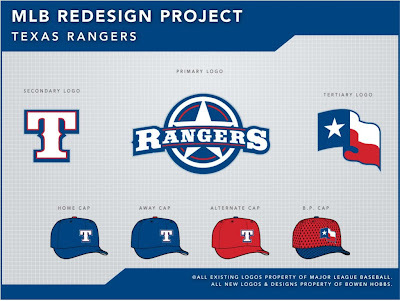 Feel free to leave a comment on the Rangers design above, World Cup 2010, or anything sports design related.